Anointed Deacon (Gesalbter Diakon) inkl. 0% MwSt. 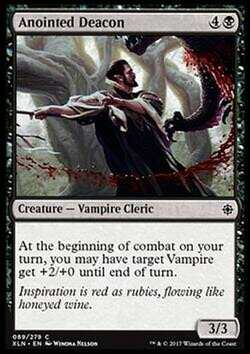 Regeltext: At the beginning of combat on your turn, you may have target Vampire get +2/+0 until end of turn. Flavourtext: Inspiration is red as rubies, flowing like honeyed wine.